Shopping abroad for safer and cheaper products has become common for large numbers of Chinese. Now the Chinese government wants to curb that cross-border flow of goods by raising customs fees and import taxes. This will not only hurt Chinese shoppers but also go against China’s commitments when it joined the World Trade Organization (WTO). Chinese authorities implemented a new tariff policy on April 8 that applies to products imported through e-commerce, as well as goods physically brought across the border. While the limit on imports of duty-free goods purchased at overseas ports of entry has been increased from 5,000 yuan to 8,000 yuan, anything over that amount will be slapped with an additional tax rate that varies depending on the kind of product. For example, the tax rate for food and beverages, certain electronic products, gold, silver, and furniture was raised from its previous level of 10 percent to 15 percent. Clothing and accessories increased from 20 percent to 30 percent. The rate for some alcohol, tobacco, and cosmetics products were raised from 50 percent to 60 percent. A decade ago, China tried by all means to join the WTO, making a wide range of promises to do so. The most important was to reduce its high tariffs so that Chinese people could afford more imported goods. China was, no doubt, the biggest winner when joining the WTO, with its exports hitting record highs and foreign exchange reserves climbing sky-high. However, while Western countries opened their gates, China continues to raise tariff barriers to block foreign goods from getting into the country. Chinese consumers can only purchase foreign goods through cross-border travel. This is contrary to WTO policy and seriously undermines China’s reputation. Since China has extremely high tariffs, prices of imported goods are significantly higher in China than in their countries of origin. In recent years, many Chinese have gone overseas to shop. According to incomplete data from China’s Ministry of Commerce, Chinese people’s overseas spending was over 2 trillion yuan ($308 billion) in 2014 and 2015. The number of Chinese traveling overseas has grown by 20 percent each year for the fifth consecutive year, reaching 180 million, or a per capita consumption of $652, and ranking first in the world, as reported by Fortune Character Institute’s China Luxury Report. When Chinese people return from overseas, their bags are stuffed with their favorite items, and often those of their friends. These range from luxury watches to saucepans, rice steamers, brand-name clothing, luxury leather goods, milk formula, perfume, and even toilet seat covers. With Chinese-made goods sold all over the world, Chinese people should not have to travel abroad to shop. But what’s available in China is either far overpriced or poorly-made imitations. That’s why Chinese consumers have lost confidence in Chinese-made products and have turned into an army of overseas shoppers. In addition to brand and quality, price is another important consideration. Outlets in U.S. suburbs are Chinese tourists’ favorite go-to places. 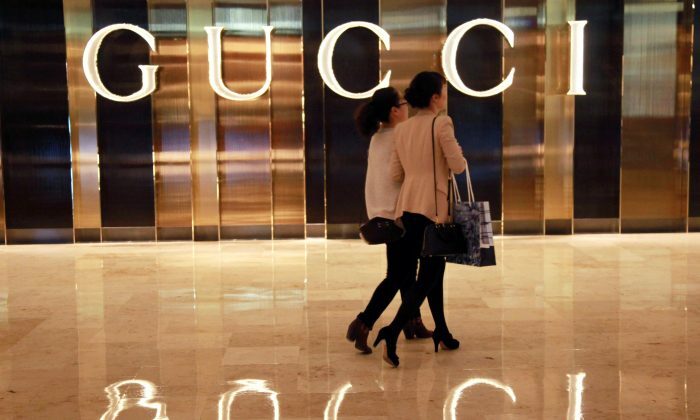 There they find all kinds of dazzling well-known brand products, including big-name apparel and leather goods that even without discounts are only about one third of what they cost in China. Even some “Made in China” clothing is sold in the U.S. at a much lower price than in China. It’s a bit odd, given that these were shipped long distances from China, and the U.S. is a country with higher per capita income and higher labor costs. Yet Americans can enjoy inexpensive, quality products from China that Chinese cannot. Especially after the melamine-tainted milk powder scandal, Chinese people have rightfully become distrustful of domestic goods. Chinese tourists, including many Shenzhen citizens, love to shop for brand products in Hong Kong, just adjacent to Shenzhen. Imported baby milk formula is often sold out as soon as it hits the shelves. Some Western countries even had to set quotas on baby formula specifically because of the influx of Chinese customers. Shopping overseas does not necessarily mean that Chinese blindly worship foreign-made brands or that they’re carelessly squandering their money. The Chinese people used to support domestic products and local enterprises. But in recent years, and especially after the melamine-tainted milk powder scandal, they have rightfully become distrustful of domestic goods. The government’s new “protection” tariff may actually have some unexpected negative consequences. By raising taxes on cross-border imports, it lessens the motivation for Chinese enterprises to innovate and to improve product quality. In other words, it protects obsolete production practices, as well as the spread of fake and poorly made products. Helping Chinese consumers obtain quality merchandise at a price they can afford, without them having to go abroad and cause trade imbalances, should be the Chinese government’s priority. Instead, the government raises tariffs, an open attack on Chinese cross-border shoppers. This is an abridged translation of Cai Shenkun’s Chinese article, posted on the author’s personal blog. Cai Shenkun is a well-known Chinese economist and blogger. He writes columns for a number of prominent business websites and was named a Top Ten Influential Blog Writer on Phoenix Television’s website for three consecutive years.